Wine Milkshakes – With just two ingredients, this is the easiest boozy drink you will ever make. Just blend dessert wine and vanilla ice cream and you are on your way to having the best adult milkshake you can imagine! Boozy milkshakes are my new favorite thing. I saw them at almost every restaurant that we went to in Vegas and soon fell in love. I don’t know what is less shocking here: that they have boozy milkshakes all over Vegas or that I fell in love with, yet another, type of dessert. At the beginning of October, we attended our friends’ wedding at a winery in South Georgia. Being the alcohol wine enthusiasts that we are, we just had to try the wines while visiting. It was one of the best tastings we’ve ever done, mostly because we tried every single wine they make (which was about 12). The grand finale of the tasting was their dessert wine. But they did a little something extra special for the dessert wine: they served it over a scoop of vanilla ice cream. Whaaaaat?! You just stir the wine into the ice cream until it’s all smooth and then take a bite. And holy moly. What a game-changer!!! On it’s own, the dessert wine was a bit much for me. Ultra rich and heavy. But the ice cream totally mellowed it out and made for one heck of an adult dessert. We were super impressed. To no one’s surprise, we bought 2 bottles of the stuff. So how exactly did we get to wine milkshakes from that? Okay so let me just say…I can’t take any credit for this one. My husband developed this genius idea a couple weeks ago. He just splashed some of the dessert wine over vanilla ice cream, added it to the blender and boom! 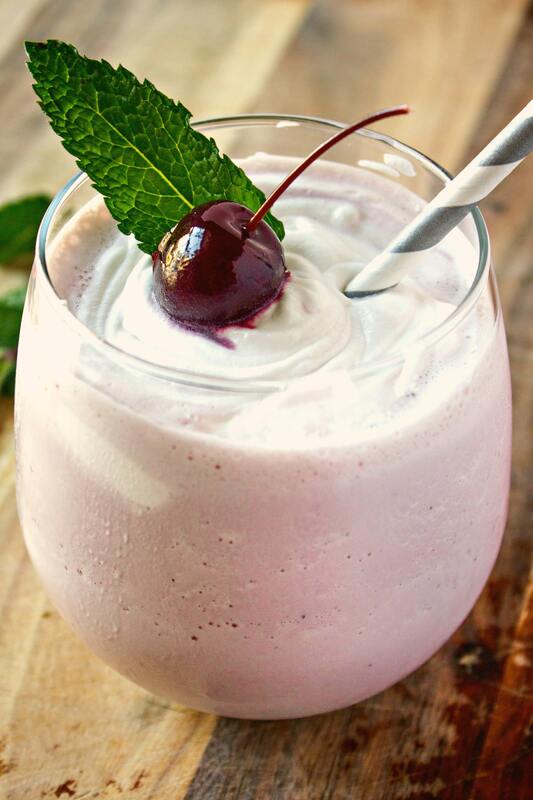 A wine milkshake was born! I did, however, add on the whipped cream, cherry, and a straw. So I earned my serving. Make sure you buy red dessert wine (port, madiera, etc) and not table wine (merlot, pinot noir, etc). The dessert wine is heavier and has more alcohol content so it won’t get drowned out by the ice cream. The flavor really stands out. Use any vanilla ice cream you want! Our favorite (right now) is Blue Bell Natural Vanilla Bean because the vanilla bean is so prominent (see the flecks in the pic above?!). But you can use whatever kind you want. Even vegan ice cream or frozen yogurt. Make sure the ice cream is slightly softened before you begin. If it’s rock-solid, it won’t blend evenly and will turn out chunky. If you’re using frozen yogurt or gelato, you probably won’t need this step because they are already softer consistencies. Let’s take a second to talk about the best cherries that I’ve ever had: Amarena Cherries. They hail from Italy, are darker in color and pack wayyyy more flavor than a maraschino cherry. It’s almost like they have a slight amaretto flavor but there’s no alcohol added to them; it’s just their natural flavor. I definitely recommend using these to top your milkshakes and sundaes. It adds sophistication to an otherwise childlike drink. You can get them at most special food stores, Italian markets, or using this link. I really hope you enjoy this unique drink! Have you had boozy milkshakes before? What kind do you recommend? With just two ingredients, this is the easiest boozy drink you will ever make. Just blend dessert wine and vanilla ice cream and you are on your way to having the best adult milkshake you can imagine! Take your favorite vanilla ice cream or frozen yogurt out of the freezer. If it is rock-solid, let it softened a little on the counter until it's scoopable (5-10 minutes). Scoop the entire pint of ice cream into a blender. Add 1/2 cup of dessert wine. Place lid on blender and blend on high until smooth, about 30 seconds. Pour into a wine glass and top with whipped cream and a cherry (if desired). Serve with a straw and enjoy! Thanks so much for you’re feedback! I’m glad you like the recipe! Yayyyyy! So amazing yet so simple!!! Thanks for the feedback! This is the easiest recipe to follow.. and so delicious!! Thank you for making it. So simple…absolutely divine !!!! Oh My! Just looking at the milkshake like a hungry baby. I’m lactose intolerant. Would vegan ice cream give me the same outcome? I haven’t tried it but I think it would work just the same. You might need to adjust the proportions, depending on the consistency of the vegan ice cream. Just test it out after you’ve blended and add more ice cream if it’s too runny or more wine if it’s too thick. Hope that helps!! Holy moly! I never thought of that, but it makes sense. I like amaretto drizzled over icecream, so why not dessert wine? Yum! I love this idea, Sharon. Will for sure make it. Great idea! I’m looking forward to trying some, maybe this weekend! What a totally AWESOME idea. I am a wine lover and have never put wine in milkshakes before. I will have to remember this for next summer! Thanks so much! That’s a great idea! This might just be the best idea I’ve ever heard of! Two of my favorite things wine and milkshakes! Aw thanks so much! And who would have thought the best idea would be the simplest! Oh that’s awesome! I bet a white dessert wine would work. I need to try it out! Whoa! How did I not know these existed!? I am in love with this idea! These need to happen in my house this weekend! Delicious I never thought of making wine milkshakes, you are genius. It’s been so hot in Los Angeles this week, I can’t wait to try this cold, refreshing cocktail! I love this idea!! I’ve had port with ice cream (try it with salted caramel – you won’t be disappointed!) but never thought to put it in a milk shake. I’m going to have to try this! Oooooo I love salted caramel ice cream. I can’t wait to try it with the dessert wine! well i certainly know what I’m making this weekend! I’ve never heard of a wine milkshake but this sounds amazing! I’m going to make this with my blackberry wine! What a creative idea! You had me at wine milkshakes! Wine milkshakes- wow. These sound great! We sure needed something like this on election night, it was intense! Oh man, can’t wait for pregnancy to end to whip some of these up!! What a delicious idea! I cant wait to try this! I don’t normally like wine (shocking I know) but I wonder if making it into this delicious looking treat would help! Ummm wine and ice cream?! Sounds like the perfect combo to me. Would love totry this! Wow, my mind is blown!! 2 of my favourites that I never thought of putting together. So trying this one!!! I know right?! Mind blown. I hope you like it!!! Ahh you don’t like cherries?! It’s ok. I used to be that way, too, actually. No worries! You can just top with a strawberry. Or nothing at all! THIS IS BRILLIANT. Haha, pinning and trying for sure! !